All The Write Stuff: It's a wrap! 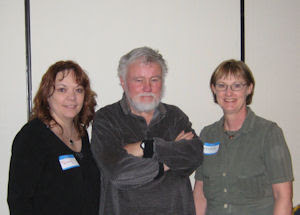 From Write Stuff co-chair Tammy Burke, keynote Jim Frey, and chair Kathryn Craft: thanks to everyone who turned out for our 2010 conference! Thanks, too, for supporting this inaugural year of the blog. I (Kathryn) promised you a wrap-up here and an opportunity to post your favorite conference moments in the comments section. Sorry it took so long! Took me a week to whip my requested agent submission into final shape (yay! hope renewed! ); I'm sure there are others of you at home doing the same thing. Thank you for the mad flurry of congratulatory notes in those few first days after the conference. Most appreciated. But now let's get to the important stuff: the stories! Every good story starts with a character at the extreme end of the bell curve, we learned from our "How to Plot Like the Pros" workshop leader Jim Frey, and in his own persona Jim provided a great character for the story of this year's Write Stuff conference. As for plot, the dialectic would go something like this: "the wannabe author insists on writing by the seat of her pants" meets opposition by Jim Frey—"that's not going to work"—creating a new situation in which the wannabe author embraces outlining, and actually feels that writing a salable novel within a reasonable time period might be possible. More than half of the 70 evaluations returned to us listed one of Jim's sessions as their favorite--an unprecedented majority, considering our group represents all kinds of nonfiction writers and poets as well. Yet Jim did not exemplify the slick promotional package that is today's successful author. Admitting to having lost his comb in the 1970s, Jim more often came across as a gruff old mountain man ("Oh no," I heard the What Not to Wear crew say, "that plaid flannel over-shirt is all wrong with those pants!"). But just when you thought you had him pegged, he'd say something unexpectedly tender. His comment during the keynote about why we write—to transform ourselves—had me suddenly close to tears. But Jim was only part of the conference. Molly Cochran and Jordan Sonnenblick also wowed, and every other speaker was either noted as a favorite or remarked upon kindly in our evaluations. But the conference isn't just about the sessions—a lot of networking and informal conversation creates memorable moments, too. What are some of your favorite 2010 Write Stuff moments? I'll get the ball rolling here, then add my own comment. Please follow suit! We all had different experiences, and will be the better for sharing them. That's what the Write Stuff spirit is all about. After his morning session on Saturday, "The Power of Knowing Your Premise," Jim pulled me aside in the hallway to review his schedule for the rest of the day. Keep in mind he was asking me after two full days of his workshop, and after the hubbub of the conference was well underway—my brain was already "Freyed." So I went to look up his schedule in my notebook. He said, "Don't bother, I have it here [he flips through his clipboard]...I think it's the keynote, right?" Sounded good to me. As he walked away from me down the hall, affording me a great view of that unkempt hair, I heard him say, "Good. I have to go to my room and write a new keynote. I used up all my material in that last session." I hadn't yet stopped laughing when Dianna breezed down the hall. Jim must have just missed her. "Do you know where James Frey is?" she asked. I told her he was in his room, rewriting his keynote. And she said, "Room 235 is full of people waiting for his informal genre chat." I called Jim in his room, told him about the mix-up, and he immediately headed for Room 235—and led a genre chat that at least one participant would remark was her favorite session of the entire conference. Following that, with no planning session remaining, Jim delivered a keynote from handwritten notes that many would consider the highlight of their conference. Please leave a comment: What was your favorite Write Stuff moment? "I love research. It keeps me from the agony of the page." Two Jim Frey quotes from the keynote address that remain in my Writer's Notebook. "About your spouse. You're going to need a new one." "But Uncle Frank is coming over." Jim was the highlight of the conference. I turned around to lock Dave's eyes at that first one, since he was at the next table, to see how he took it. After, he said we'll stay married--but he's now going to require 2,000 words a day from me! And that second one--my, but I don't think that particular word has been used in a GLVWG keynote before! Gave it even more power. I was not a big outliner before the James Frey workshop, but his comment, if you write bios for your main characters and do a step sheet for the novel, you can write a first draft in a month or two, and cut down on the number of revisions - James has convinced me to try his method. I also loved his advice to make a contract with yourself to write 2,000-10,000 words a day and keep that contract with yourself - F*@k uncle Fred. Plus his advice on how to improve your prose by imitating the writing style of great writers - do it as a writing warm up each day. I also loved chatting with so many writers - everyone was so friendly!